I know I haven't written in a while. A) I haven't been inspired by any business stories recently, and B) I didn't want anyone to miss the Gary Kaltbaum link Christmas present I gave everyone. 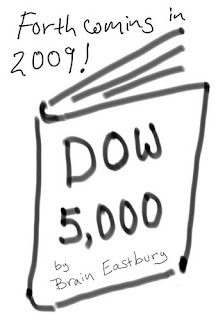 If you were fortunate to have read this earlier post, you will recall I had a dream in October 2008 about the Dow going to 5000. Yes, people thought I was crazy, hallucinating, nutso. I admit it seemed that way at the time. Well, all you naysayers can kiss my big white a**. Yesterday the King of Bear Markets, the guy who has been right throughout this entire stock market crash, Gary Kaltbaum, ranted that if all this Obama spending continues, the market is going to 5000! In the radiocast from 2/25/09, Kaltbaum likens Obama's policies to former President Carter's. And we all know how well the economy fared during Carter's tenure. I voted for Obama after Ron Paul was not in the running to win and didn't want to "waste" my vote. I thought I was ready for "change" but I guess I wasn't as prepared for it as I thought. Guess there's a time and a place for everything and I don't agree that now is the time to invoke some of the current "changes", i.e., I am a fiscally conservative person and believe in responsible spending. This is exactly why I wanted Hillary. The economy was stellar during the Clinton years. It's today below 7000 so I think your dream (nightmare) of 5000 is on its way. Good you got out when you did.